Geneva Show concept March 2011, but could lead to a production '3+3' six-seater shoebox-shape car, like the original 1950s Volkswagen Microbus. May happen with electric motor. 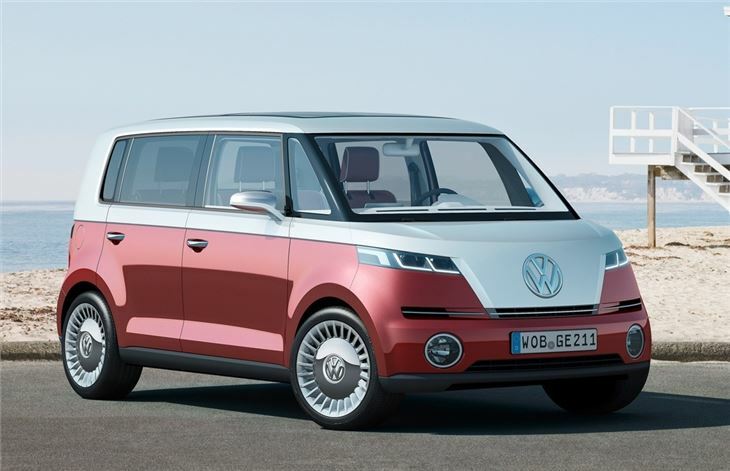 Sadly missing from 2011 Frankfurt Show, as if it never happened, just like previous Microbus concept cars. 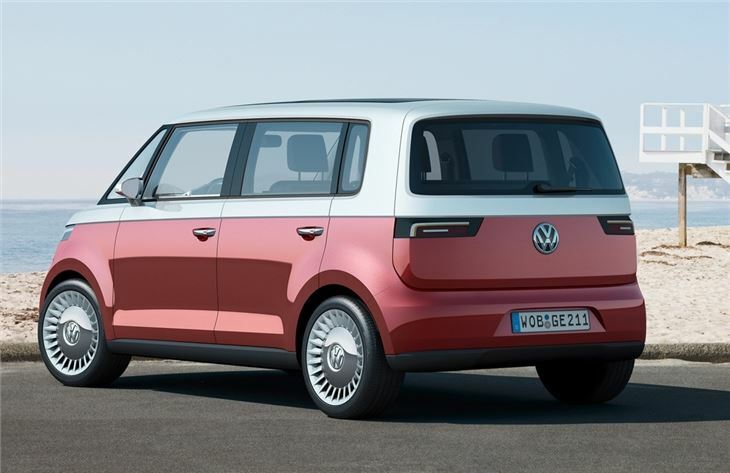 Report from New York Auto Show that Volkswagen Bulli might now happen buit on MQB subframes and with a FWD electric motor. Compact size of electric motor makes thhis feasible. Volkswagen unveiled the latest version of its iconic Microbus - the new ‘Bulli' concept - at the Geneva Motor Show 2011. The vehicle was first shown in 2001 and has been fully updated to be a new generation of Volkswagen people carrier. More compact than the earlier concept vehicle, it is powered by an electric motor and fitted with six seats and infotainment control via iPad. It is front-engined and front-wheel drive. The new Bulli measures 3.99 m in length, 1.75 m in width and 1.70 m in height. Wheelbase is 2.62 metres, slightly longer than that of a Golf (2.58 m). Bulli also has a wide track (1.50 m front and rear) in relation to its body width. Front and rear overhangs are very short. Energy is supplied by a 40 kWh lithium-ion battery concealed in the sandwiched floor behind the sills which powers the Bulli's electric motor.This engine produces 85 kW of power and 260 Newton metres of torque (115 PS/192 lbs ft). Theoretical driving range is up to 300 km (186 miles) - a high value for an electric car. The new Bulli can accelerate from zero to 100 km/h (62 mph) in 11.5 seconds, and has a top speed (electronically limited) of 140 km/h (87 mph). Bulli has six seats: three on a front bench seat (which can be folded) and three on the rear bench which can be folded flat to maximise loadspace. 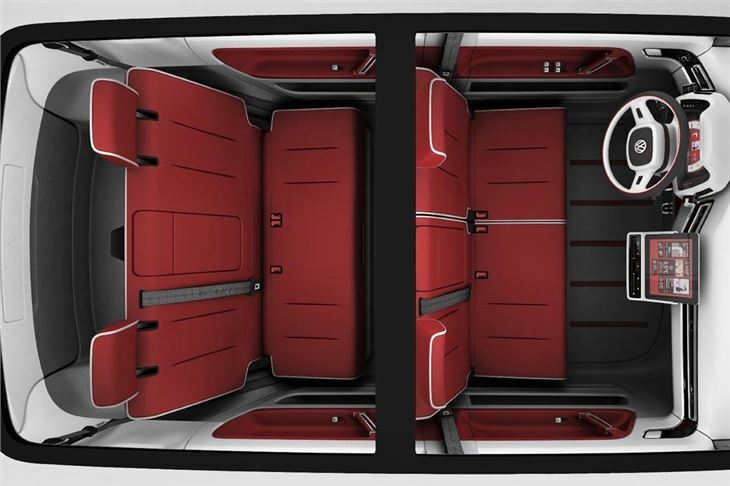 When all six seating locations are occupied, a 370 litre loadspace is available; with seats folded, the cargo capacity of the 1.8 metre long interior increases to 1,600 litres. A removable iPad in the centre console serves as a multifunctional touchscreen. Along with Internet-based applications and the media centre, it also handles phone and navigation functions.